The year before last, Zilla and I got a puppy. I suffer from allergies; Zilla likes doting, cuddly dogs. We wanted a dog big enough to go with us on runs. One day we saw a mellow, medium sized, non-shedding, adorable pup we both liked lying behind the counter at a bicycle shop. “What kind of dog is that?” I asked the owner. We nodded. There was only one dog in the shop. “She’s half Lab, half poodle.” I’d never heard of such a thing. When I was a kid Katie was a popular name. My class had Katie M. Katie K., Katie B. and Katie W., not to mention a Kate and one Catherine with a C and one Katharine with a K.
I like the name Kate. It might be my favorite name ever. But I vowed never to use it. For my child—for my dog–I wanted something unique, original, not the same. Zilla and I found a Labradoodle breeder, and then a litter, and made a deposit. While we were waiting for our pup we talked about names. The first decision was human name or animal. When I was young our dogs had distinctly dog names, like Bear. Later we inherited and adopted two dogs with bland human names, Maggie and Charlie. One of my sister’s friend’s came over to play and looked at the dogs wide-eyed. “Those are my parents’ names,” she said. She had long soft dark hair, glasses, and a quiet voice. She promptly stopped playing with my sister and began yelling rude commands—and laughing—at the dogs. The closer my husband and I got to getting our puppy the harder we found it to settle on a name. All the names we tried on sounded too stuffy or too silly or just plain wrong for a dog. Then at a dinner party someone mentioned the runner, Zola Budd. My husband nodded. It was the most agreement we had so far. “With and e or and umlaut or oo or a y?” I asked. Not that it made any difference. I didn’t know any Zoe (ë, oo or y)’s at all. And then we got our puppy, and then I did. While I maintain that our Zoe is uniquely, adorably, sweet, and clever, she is not uniquely named. I have met four other Zoe’s, who are also Labradoodles, in our neighborhood so far. One is in our Zoe’s dog class, another goes to the same dog park. One is even the same color. 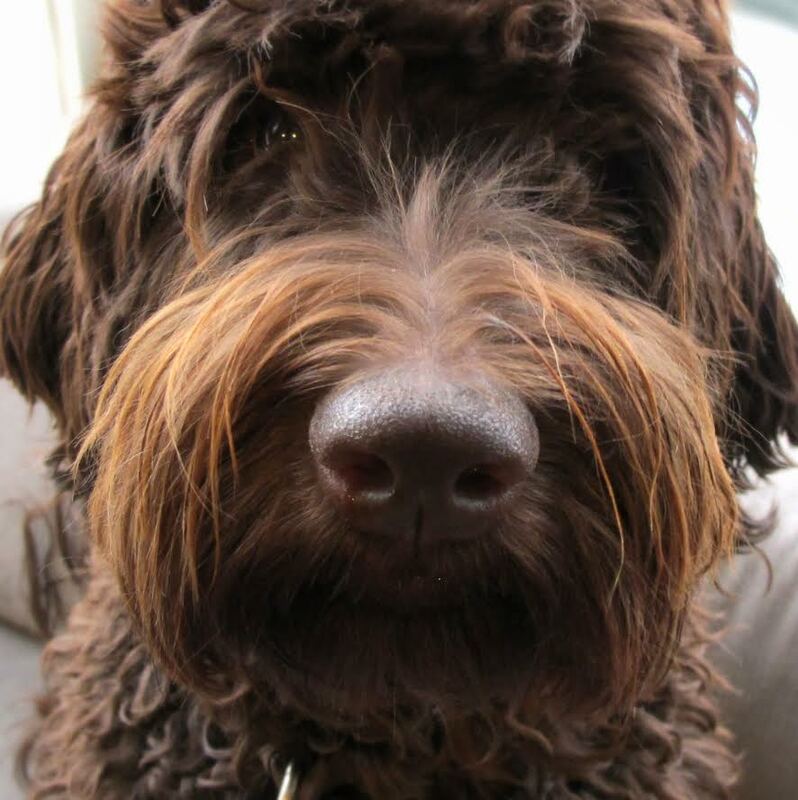 My cousin, my aunt informs me, has a Zoe the Labradoodle in another state. In the first week, I had two women bend down to pet my Zoe, and ask her name. Three other people have stopped, smiled and asked give my Zoe a good pet. The worst time, I was walking Zoe about a week after we brought her home. She waddled—uniquely, adorably—in the grass. An elderly fellow stopped and asked if he could give her a pet. Of course, I said. He kneeled down and spent five whole long minutes rubbing her ears and stroking her tummy. Then he started to look really choked up. He slowly pushed himself up and put his hands in his pockets. Then he pulled them out again. “What’s your name, little dog?” He asked, as if she just might answer. He gave me the most horrified look. “Really?” he said, and his eyes started to water. Tears came to his eyes. He stood up quickly and shuffled down the block so fast it was almost a run. Zilla says, and he might have authority on this, with a name like Zilla, that we should give our child a name that people recognize, that won’t be weird, that people will know how to pronounce, and understand. But I don’t know. I can’t stop thinking of Zoe every time we try out a name for our child.